At least 12 were killed in an attack at the French satirical magazine Charlie Hebdo. 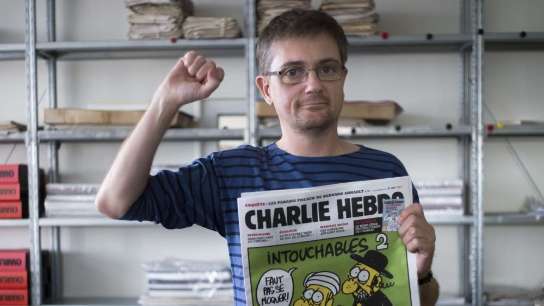 Four cartoonists are among the dead, including editor and cartoonist Stephane “Charb” Charbonnier, seen here defiantly holding one of the magazine’s covers. The magazine was fire-bombed in 2011 for publishing a cartoon of Muhammad and is know for its provocative satire. The Guardian has live updates here of developing events.